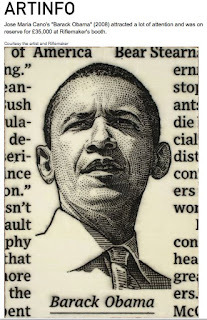 HEDCUTS: Wall Street Journal's stipple portraits: JOSE MARIA CANO, WHAT EXACTLY IS HE DOING? Hedcut = a newsroom abbreviation for "headline cut": a hand drawn, uniquely stylized pen and ink illustration, used only by the staff illustrators at The Wall Street Journal. Authentic WSJ stipples are never digitally generated. 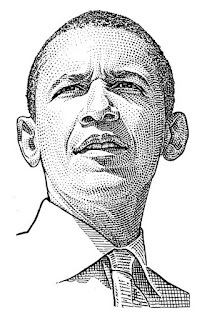 I am a senior staff illustrator at the WSJ, one of only 5 illustrators creating authentic hedcut portraits. JOSE MARIA CANO, WHAT EXACTLY IS HE DOING? And, what does he do? 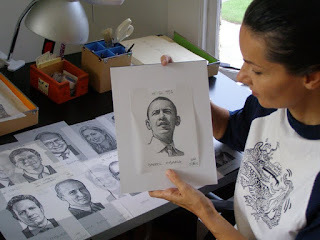 He cuts out portraits from papers, blows them up and painstakingly recreates them in wax paraffin ... dot by dot. He's flying under the cover of "newspaper clipping" appropriation, but does that apply in this case? I say no way Jose! 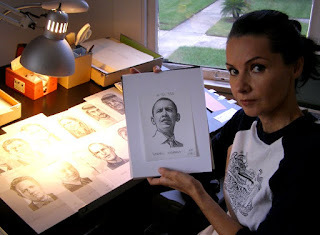 You can clearly see he is getting credited as the author of these portraits. This is me in my studio holding the original drawing. On my desk are a few of other illustrations I made (all for the Wall Street Journal) also used ("appropriated") by Jose Maria Cano! Now, here's something I found especially appalling. "Meeting with Vaclav Havel was the last point of Barack Obama's Prague visit. 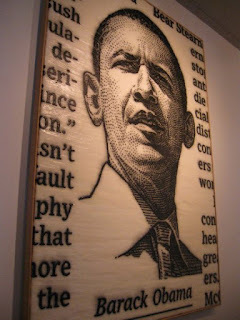 During this private meeting, Vaclav Havel presented American President Barack Obama - a portrait of the president by the Spanish artist José-María Cano. 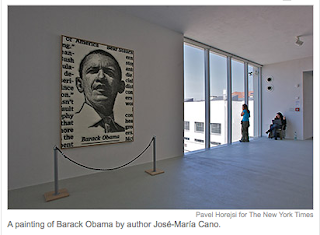 "José-María Cano generously offered this painting to Vaclav Havel as a gift for Barack Obama", said Leos Valka, director of DOX, Centre for Contemporary art in Holesovice, Prague. The painting will be exhibited at the Centre from Thursday, April 9. until April 27, 2009. After that, the painting, measuring 210 x 149,5 cm, will travel to the White House. The portrait is created using the encaustic technique of painting with hot wax. After viewing the exhibition Welcome to Capitalism!, which was on view at DOX Centre from last October to February this year, Vaclav Havel was enthusiastic about the Spanish artist's works. Therefore, DOX Centre's director, Leoš Válka offered President Vaclav Havel the option of presenting President Barack Obama with the portrait and Havel welcomed the idea." All joking aside (yes, that up there is a bunch of winks, people! ), this is no laughing matter and I invite all my friends, all you fellow bloggers, artists and anybody who's concerned about protection of artists' work, to please pass this post along. He's having a solo show at the Riflemaker Gallery in London on November 9th, by the name "The Wall Street 100"! And yes ... you guessed it: he is "using" 100 of our drawings! To the Spanish and the Czechs ... I was totally joking! I thought that was clear, but since a few took offence, I apologize.